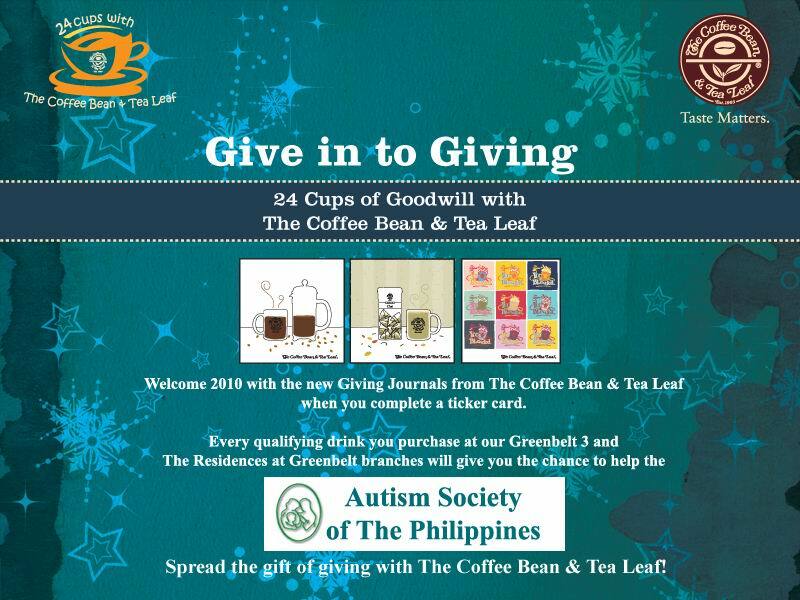 Autism Society Philippines is one of the beneficiaries again of Give in to Giving: 24 Cups of Goodwill with The Coffee Bean & Tea Leaf. 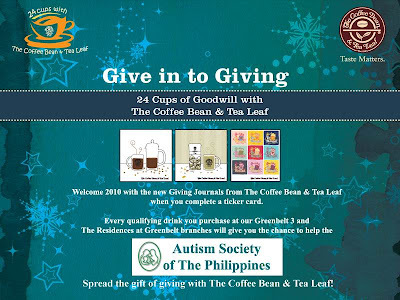 In particular, ASP’s programs are highlighted in our partner CBTL outlets - Greenbelt 3 and other Residences of Greenbelt branches. You can enjoy a Limited Edition of The Coffee Bean and Tea Leaf Giving Journal every time you complete a ticker card. d. Any 9 Regular or Large Original Ice Blended, Coffee-based or Tea-based beverage. * A portion of the total sales of these drinks will be donated to the store's partner advocacy at the end of the promo period. 2. Your ticker card must always be presented so that a box may be stamped whenever its corresponding drink assignment is purchased. 3. Once all 12 drinks are stamped and completed, you can now claim The Coffee Bean & Tea Leaf Giving Journal. You may choose from any of the 3 specially designed The Coffee Bean & Tea Leaf Giving Journals. 4. The completed stamp card should be presented and surrendered to the branch wherein the Giving Journal was claimed. The cashier will punch the stamp card to prevent reuse. 5. Promo period is from November 4, 2009 to January 31, 2010. 6. Giving Journals may be claimed all throughout the promo period until 60 days after the promo period has ended.